I know one of the things I dread the most this time of year is when you are cosy and warm and know that you need to get undressed to get into a cold bed. This is a lot worse for us as we have no heating in our house. Just the nice warm fire in the downstairs living room. This means it gets very cold upstairs. 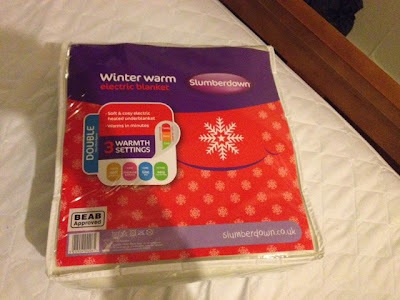 Thankfully Slumberdown offered me their Winter warm electric blanket to review. There were no second thoughts about this offer, I couldn't wait to try it out! It was nice and easy to set up. 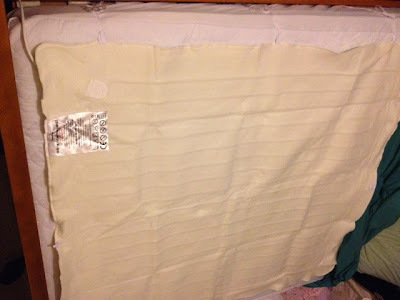 Simply remove from packaging and place on mattress at the foot end of the bed. There are strings which can be tied around the mattress to avoid it slipping as you can see in the picture below. You then simply pop your bed sheet over the top of the blanket and use the plug to connect to the plug socket. There are three different heat settings, 1, 2 and 3, with 1 being the lowest and 3 the highest. We use this blanket daily now. We pop it on an hour before we go to bed, not that it needs to be on that long but we love the bed to be very warm when we get in! When we have forgotten we can put it on number 3 for just 5-10 minutes and that is more than enough. The blanket is machine washable although I haven't felt the need to wash it yet. There are detailed instructions on how to wash safely to ensure you don't damage the blanket. I absolutely love the electric blanket and Andy has declared it as the 'best review product I have ever received' and I have reviewed lots of fab products over the years! The Slumberdown electric blanket is available in single (£20), double and kingsize (£30) and is available to buy at Tesco.